Breitbart Texas traveled to the Mexican States of Tamaulipas and Coahuila to recruit citizen journalists willing to risk their lives and expose the cartels silencing their communities. The writers would face certain death at the hands of the various cartels that operate in those areas including the Gulf Cartel and Los Zetas if a pseudonym were not used. Breitbart Texas’ Cartel Chronicles are published in both English and in their original Spanish. This article was written by guest writer @MrCruzstar from Reynosa. REYNOSA, Tamaulipas — The daily landscape in Mexican border cities has changed in recent years. A decade after the war on drugs started in Mexico, the militarization is total. Life has changed in the communities in the northern part of the country. 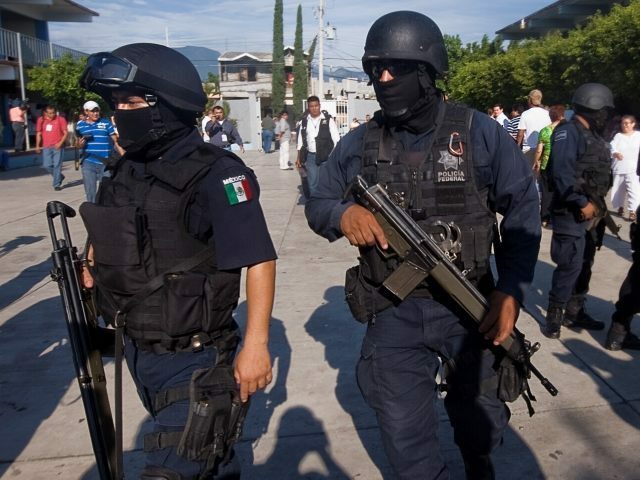 Gradually in Mexico, particularly in the states with the most cartel activity became militarized. The figure of a local police officer with a civilian type uniform, a police radio and a handgun is all but a memory; likely to never come back. The change comes after organized crime changed their operations from a corporate-like structure to a paramilitary force in an attempt to guard its territories and expand its franchises. Intelligence agencies at the time ignored this, but when organized crime groups surpassed the government they turned to a wartime strategy using the military to undertake civilian tasks. The war brought along the loss of individual rights for the common citizen. The party line told by some pushes “public safety” over civil rights claiming it’s the good guys fighting the bad guys, but at the same time allowing the military to violate human rights. We have lost the right to free travel as guaranteed by our constitution. In Tamaulipas we drive to work seeing convoys of cartel gunmen on one side and convoys of soldiers on the other. How is it possible that with such an enormous deployment of military forces we are not safe? We are stopped and searched in illegal checkpoints by both organized crime and the military where they see us with distrust. They check our cellular phones violating out privacy while they question us to no end. Innocent bystanders become collateral damage or simply numbers in accidents that are justified for the sake of “securing public safety.” A recent event has made me analyze how living in a war zone has made us insensitive as individuals. We have become accustomed to shootouts, violence has become commonplace and a regular part of life. Border violence has become just another conversational topic. In the border city of Reynosa on January 14 , along Boulevard Hidalgo, one of the main highways in this city, an SUV came under fire by Mexican Federal Police officers. The Chevrolet Suburban had three families on board when it was fired upon by public servants who criminalize the public at will. Luckily in this case, only one of the fathers was injured in the shooting. Authorities never provided an official account of the events and citizens expressed their outrage on social media; however, the case was simply forgotten after a few days. No one was held responsible for the attack nor punished. Citizens in this city now have to fear two sides, organized crime and military forces (from whichever branch or agency). Authorities now use tactical equipment and assault rifles. Local police officers have been replaced with military forces. State police agencies have had their members trained by the military and they have begun to dress the part. The stigma of criminalizing the average citizen for their clothing, tattoos or car they drive had become part of everyday life. I am not making excuses for organized crime since their members hide among the community, but I have seen the inefficiency of intelligence agencies that are very costly to the common taxpayer. The expense doesn’t avoid the abuse by law enforcement agencies and nor provide for protocols to protect innocent civilians. “Wachos” (Mexican soldiers), “Poliwachos” (soldiers that carry out police duties), “Polinegros” (Fuerza Tamaulipas police officers), “Popeyes” (Mexican marines), “Federicos” (Federal police officers), these words have become part of the everyday conversation in Mexican border cities. As time goes by, these law enforcement corporations have fallen into corrupt practices. The lack of coordination and distrust among agencies has led to confusion and innocents have been attacked. There have also been cases where criminals have been captured, extorted and then released. Those tasked with guaranteeing public safety are now competing with organized crime members in order to carry out illicit activity.